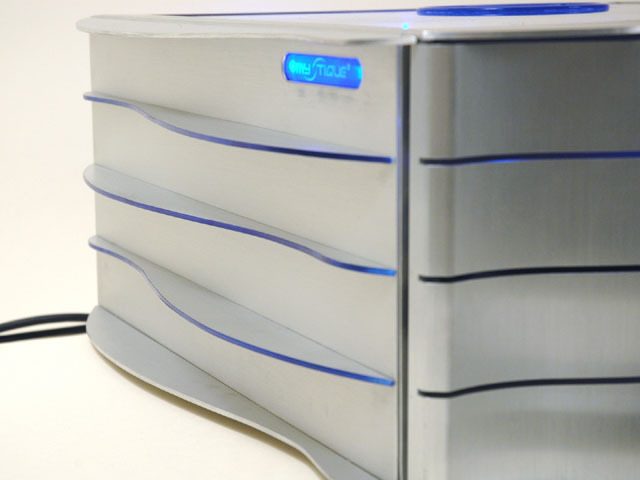 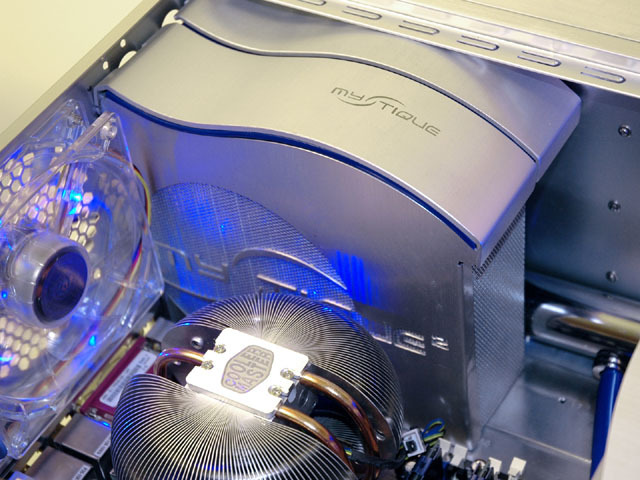 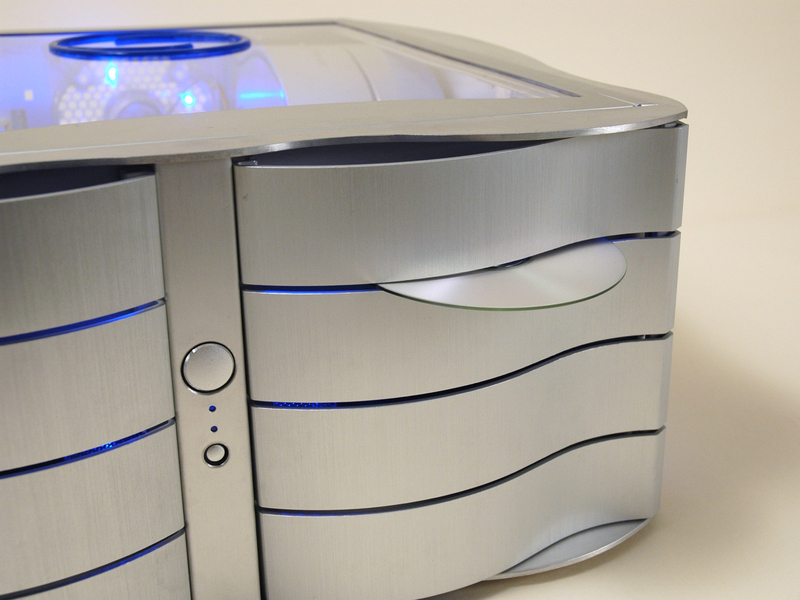 I came up with the idea to create one HTPC desktop-style case using two Mystique 631 aluminum tower chassis. 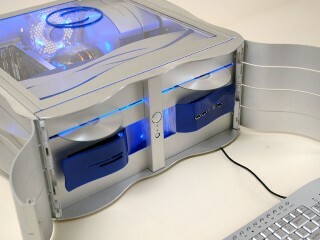 The main idea was to keep evident the Mystique heritage and styling throughout the case, inside and out. 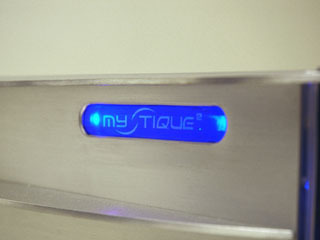 The wavy theme was carried out in tandem with logo elements to create a consistent and elegant look, while keeping its ultimate use in mind. 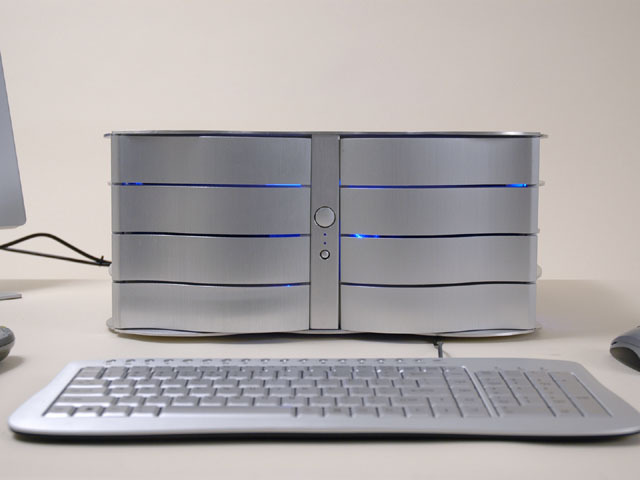 This being a home theater PC, it will be located in my living room, and must function as a HDTV tuner/personal video recorder. Care was taken when selecting components that were best suited for such a task (i.e. Mars cpu cooler running in silent mode). I wanted to design the case in such a way as to make people immediately think "Mystique" when they first see it. The Mystique's signature front wavy doors were retained, and aluminum fins were added on both sides and aligned with the doors' slots, continuing the wavy theme around the case. 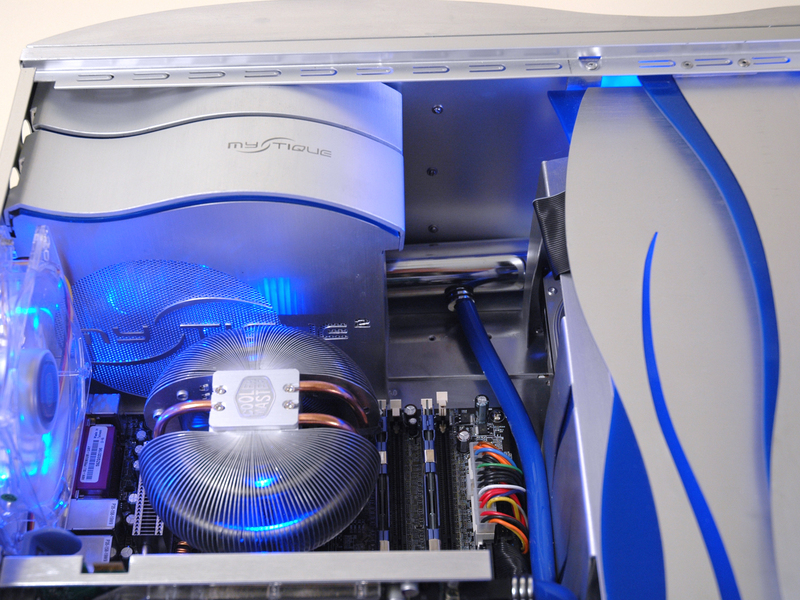 and a blue plexi ring centered over the Mars cpu cooler. Since the new sides used to be the old tops of the cases, they still have the IO port holes, except now they are blue-lit logo badges. 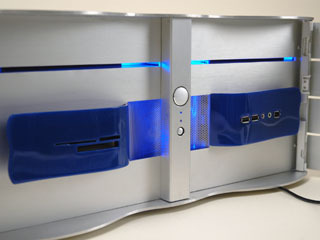 The new IO panel resides inside the front doors in a decorative blue wave. 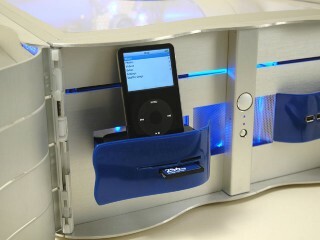 Opposite the IO panel is a 10-in-1 card reader that pulls out to reveal an iPod docking station. 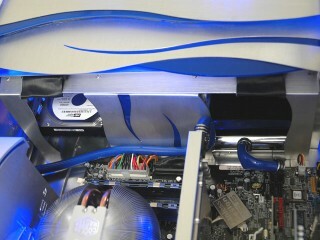 Centered in between the two blue waves is the air intake for the front fan, complete with concaved mesh behind the power/reset button post. Inside the case, I built an entirely new drive cage, having gutted its original contents. 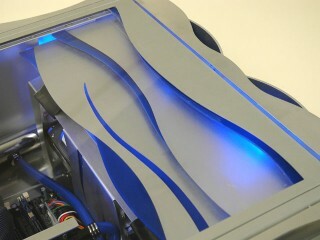 I incorporated the original tool-less cages back into the new design, adding an intake fan in between them. The DVD drives are mounted on top, and a stylish rear cover was devised to direct cool air through both sides before entering the main part of the case. The drives are perfectly aligned so that one could insert a disc without having to open the doors. 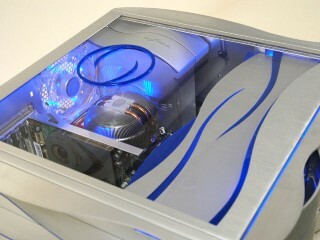 The power supply was concealed utilizing more original front bezel parts and brushed aluminum side paneling. I incorporated the logo into the fan grill, complete with individually cut lettering (cut by hand from the existing aluminum panel) and mesh behind the whole thing. 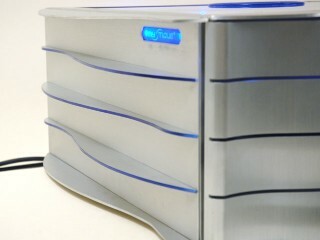 Blue plexi separates the side piece from the top wavy piece. Wire management was achieved by running the power cables first through a piece of 2 ¼” chrome pipe. 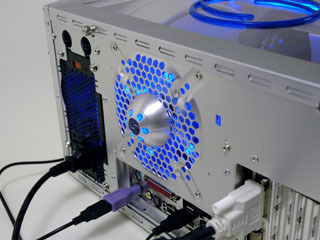 They then branch off to their destinations underneath the motherboard tray, emerging only where they plug in. 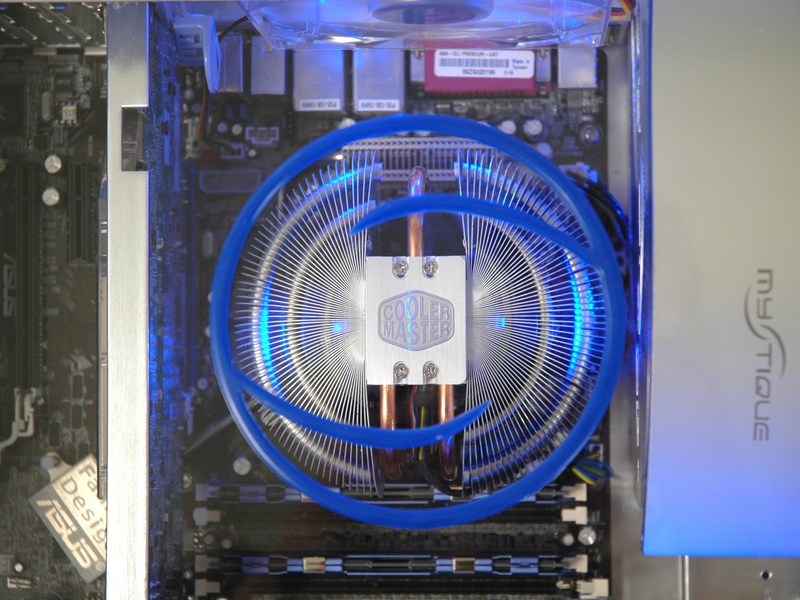 The video card power cable and SATA cable take exception to the rule, and are sleeved in blue silicon hosing with chrome end caps. 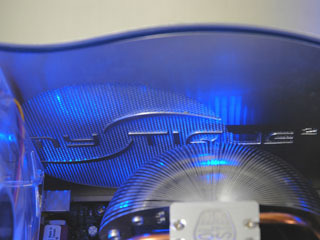 For added lighting in the back, I incorporated a brushed aluminum led dome into the center of the exhaust fan's grill. 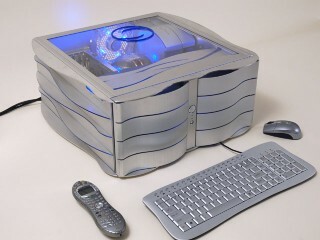 It is battery operated, and serves to light the cable hookups even when the PC is turned off. 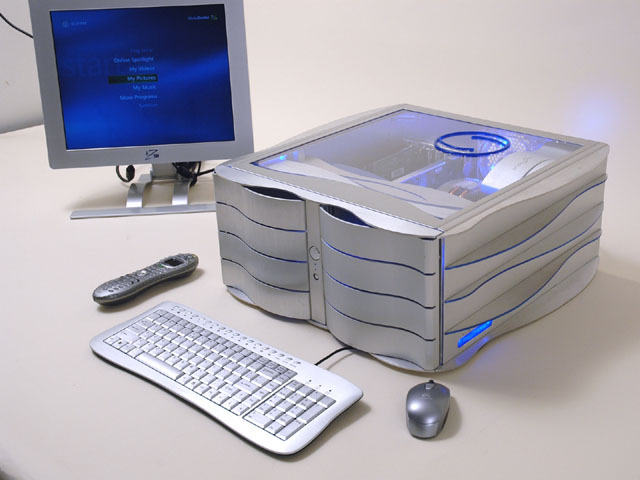 Every effort was taken to recycle items from the original cases. 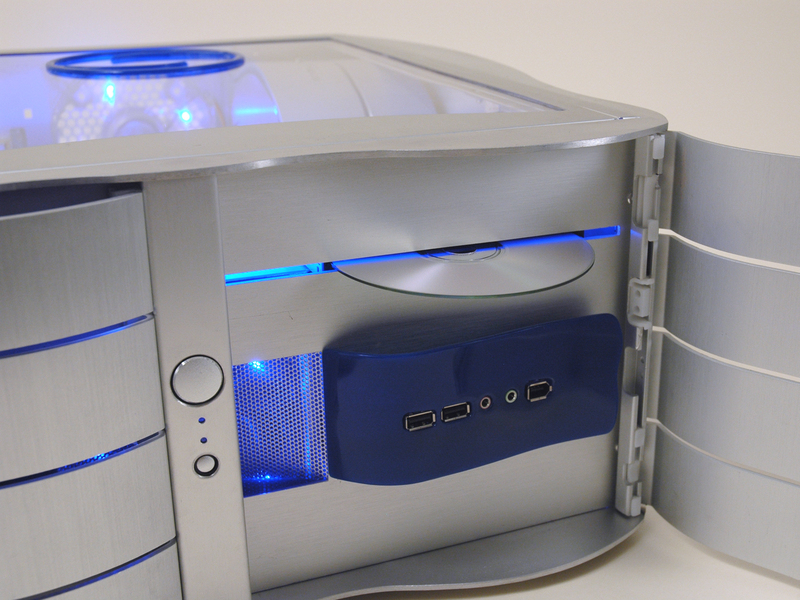 The only non-indigenous parts are the blue plexi pieces, a few support pieces and the exterior fins (made from aluminum stock purchased from the hardware store). The keyboard and mouse were chosen to match the case perfectly. It being an HTPC, it will connect to my Samsung 50" DLP television. A WinPVR150 tv tuner card, Cats Eye HDTV tuner card, a TERK indoor HD antenna and Windows XP Media Edition with a Logitech Harmony remote round out the system. 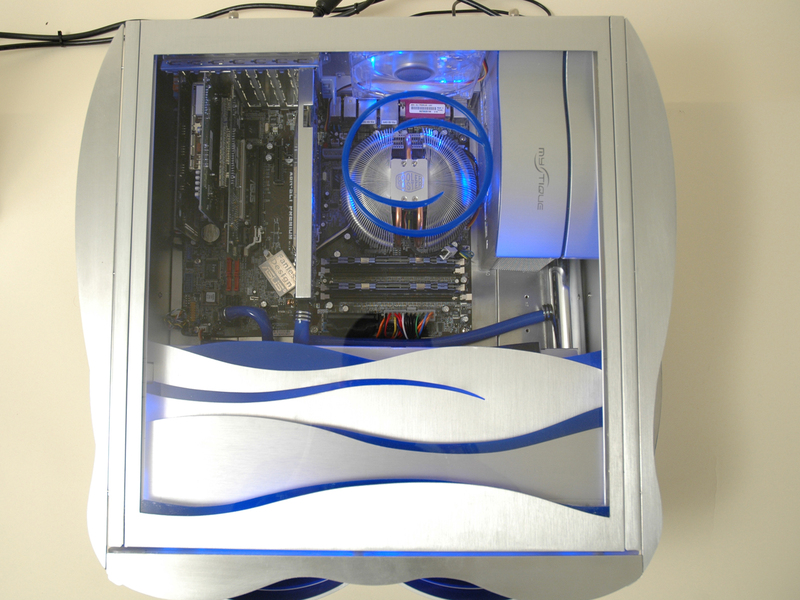 Not shown are the original stylish case feet that were relocated to what used to be the right side panel (now the bottom of the case).